(From Konica Minolta lens literature) This standard Macro lens comes with a double-floating element focusing design, and focuses from infinity to a 1:1 magnification ration without the aid of attachments. The seven-blade circular aperature produces a softer, more natural-looking background. A focus-hold button and focus-range limiter enhance focusing operations. 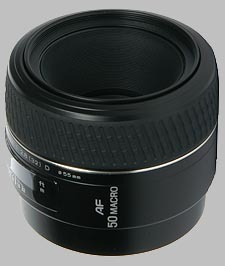 The Konica Minolta 50mm f/2.8 Macro D AF doesn't have any user reviews yet!